Does the J Bar L have two locations? The J Bar L Ranch is a single operation, managed across two locations, 280 miles apart. While we spend most of the summer grazing season at our Centennial Valley ranch, we move our cattle to our Melville ranch for the winter season. The Anderson, Brundage, Smith, and Stibal Barn rentals are all located in the Centennial Valley and operates May through September, while the Crazy D Lodge is located at our Melville headquarters and is available to rent year-round. Both are remote locations that offer stunning views and unparalleled opportunities for outdoor adventure. How secluded is the J Bar L? Our Centennial Valley properties are extremely secluded--when we say we’re in the middle of nowhere, we mean it. The Centennial Valley rental homes are approximately 45 minutes from the nearest gas station and an hour and a half from the closest grocery store along dirt and gravel roads. Our Melville headquarters, though rural, is only about 25 minutes from the nearest town. How do I get to the J Bar L’s Centennial Valley location? The J Bar L’s Centennial Valley location is more than twenty miles from pavement, so you can expect to drive over dirt roads that aren’t well maintained. Although 4-wheel drive is not necessary in all seasons, we highly recommend a high-clearance, 4-wheel drive vehicle with all-terrain tires to best access all of the roads in the Centennial Valley. Because we are so remote, GPS and Google Maps are unreliable. Once you book your stay, our guest manager will provide you with specific directions and maps to ensure a safe and easy trip. The closest airport to the J Bar L, Centennial Valley is the Idaho Falls Regional Airport, which is approximately 2 hours away. Idaho Falls receives flights from Denver, Salt Lake City, Minneapolis St. Paul, Las Vegas, Phoenix/Mesa, Los Angeles, and Oakland. You can also fly into the Bozeman Yellowstone Airport (3 ½ hour drive) or the Missoula International Airport (4 hour drive). If you are flying private air, consider landing in Dillon (1 ½ hour drive) or in Twin Bridges (2 hours). How do I get to the J Bar L’s Melville Location? Access to J Bar L’s winter ranch and headquarters in Melville is largely on paved roads, though the last few miles are on a dirt county road. Because ranch and county roads can become rough between maintenance we recommend an AWD vehicle with high clearance to make the most of your trip. You can navigate largely via GPS, however our guest manager will provide you with specific directions once you book your stay. The closest airports to our Melville headquarters are the Bozeman Yellowstone Airport (1 hour 40 minutes) and the Billings Logan International Airport (2 hours). Check in is anytime after 4pm. Check out is by 10 am. Guests should bring their outdoor gear, clothing to layer when temperatures drop, bug spray and sunscreen, sunglasses, a good hat, groceries, a camera, a high clearance 4 wheel drive vehicle with a full size spare and a can of Fix-A-Flat (recommended), any specialty toiletries, and a set of the directions provided by our guest manager. We provide pots, pans, kitchen and eating utensils, a gas grill, maps and guides, basic toiletries and pantry items, towels, linens, paper towels and Kleenex, laundry detergent, a first aid kit, Yellowstone Coffee Roasters coffee beans, ice, firewood, board games and cards, a few books and classic movies, binoculars, and a freezer-full of delicious Yellowstone Grassfed Beef (if you order with our guest manager) raised here on the ranch. Do I really need 4-wheel drive? You can reach the J Bar L’s Centennial Valley location and our Twin Bridges Fishing Cabin without a 4-wheel drive vehicle. However, we still strongly recommend renting a high clearance, 4-wheel drive vehicle in order to facilitate backcountry adventuring. The roads leading to the J Bar L’s Centennial Valley location are rough and rocky. If you are booking a Centennial Valley rental home or cabin, you will want a vehicle equipped with a full-size spare to reach us. We encourage you to drive slowly and take in the immense views to avoid getting a flat. We also recommend bringing a can of Fix-A-Flat and getting insurance for rental vehicles so you don’t have to worry about any possible windshield chips or scratches. Will I be greeted when I arrive? If we know your approximate time of arrival, we’ll do our best to greet you at your rental home. However, because we’re a working ranch, we may be out and about when you arrive. Your rental house will be ready and waiting for you and we’ll communicate clearly with you prior to your arrival so you feel comfortable navigating to your rental. Each rental house and cabin is outfitted with a basket for travel resources (such as maps and guides) and we’ll be sure to check in to make sure you have everything you need. Typically, summer daytime temperatures hold between 70 and 80 degrees, with nighttime temps dropping to the 40s or 50s. We recommend packing layers so you can bundle up in the evenings and early mornings. For guests traveling to the Twin Bridges Fishing Cabin during the winter season, we suggests packing ample warm layers (including long johns!) and wind-breaking parkas or winter coats. However, it is best to check the weather before you pack, as it can vary dramatically during the late fall, winter, and spring. Is there wi-fi or cell service? There is limited cell service for Verizon customers on the ranch and throughout the Centennial Valley. Wi-fi and landlines are provided at our Smith and Anderson rental homes for your convenience. The Brundage cabins are truly off-the-grid, but we welcome you to use the internet and phone at the Stibal barn as you come and go from your daily activities. There is both wi-fi and cell service available at the Fishing Cabin at our Twin Bridges ranch headquarters. However, AT&T and T-Mobile customers have reported spotty service. What does a fully-stocked kitchen mean? The kitchens are move-in ready. We provide fresh Yellowstone Coffee Roasters coffee beans, a coffee grinder, and a coffee maker for your use. The kitchen comes complete with pots and pans, plates/bowls, silverware, knives, pantry basics (flour, sugar, etc. ), spices, spatulas, mixing bowls, plastic containers, a hand mixer, blender, toaster, potato masher and more. Each rental house or cabin also has a gas grill ready for you to use. If desired, we can also stock your freezer prior to your arrival with our delicious, ranch-raised Yellowstone Grassfed Beef for an additional fee, just let us know when you book and we can arrange accordingly. What else is included in the rental of the houses and cabins? We provide a selection of recreation guides, binoculars, bear spray, and road maps for your use. We don’t have satellite, dish, or cable TV, but we do have a TV screen and a DVD player in each home. We also provide a collection of board games and books for you to enjoy during your stay. Each rental house is supplied with towels and linens, soap, toiletries, toilet paper, paper towels, and Kleenex. If you have special products that you prefer, we encourage you to bring them with you. If your rental features a fire pit, we will provide you with firewood and instructions on proper fire etiquette. Given our dry climate, be sure to check with our staff about safe days to burn. Does every vacation rental have a hot tub? While every vacation rental on the Centennial property has access to the Stibal Barn hot tub, only the Anderson House features a private hot tub. The Crazy D Lodge does not have a hot tub at this time. Is there a place to eat on the ranch? No. However, every rental house comes with a full kitchen, outfitted with all the pots and pans you could need, along with some pantry basics (flour, sugar, etc.) and spices. We also provide every house with fresh beans from Yellowstone Coffee Roasters. If desired, we can also stock your freezer prior to your arrival with our ranch-raised, delicious Yellowstone Grassfed Beef for an additional fee, just let us know when you book and we can arrange accordingly. If you are interested in having a meal prepared for you at your rental home by a private chef, please let our guest manager know and she can provide you with a recommendation for booking. Where is the nearest grocery store and services? For guests at the Twin Bridges Fishing Cabin, there is a small town grocery store and deli, along with all standard services, in the town of Twin Bridges, located just a few minutes from the cabin. The closest supermarket is a 30 minute drive away, in Dillon. For guests at our Centennial Valley location, there is a gas station, restaurant, and cafe in Lima, which is roughly 45 minutes from the ranch. The nearest supermarket is located in Dillon, about 1 ½-2 hours from the J Bar L Ranch. We strongly encourage folks to arrive on the ranch with everything they’ll need for their stay, since it requires a significant drive to collect any supplies. Is the J Bar L kid friendly? We are happy to accept your canine companion for a $50 per dog fee. This must be cleared with the Guest Manager beforehand and we ask that you abide by our Dog House Rules. What are the best sites for families? For group gatherings? For privacy? For a romantic getaway? The Anderson House, which can accommodate up to six people, is a great option for your family vacation. If you have a larger party but are looking to share one house, we recommend the Smith House (up to eight people). The Brundage Cabins are the perfect option for groups of couples or extended family gatherings, accommodating up to fourteen people in three separate cabins with a shared kitchen and dining area. If you’re looking for a privacy, the Brundage cabins are also our most secluded site, followed by the Anderson House and the Smith House. With a private hot tub and luxurious furnishings, the Anderson House is a wonderful choice for a romantic week away from it all in the Centennial Valley. Or escape to our Twin Bridges Fishing Cabin. Cozy and intimate, this backcountry cabin is available year-round. Is outdoor gear and equipment provided or can I can rent on-site? The J Bar L is a BYOG (Bring Your Own Gear) facility. We have a limited amount of some basic gear for you to use, but we highly recommend that you bring your own. 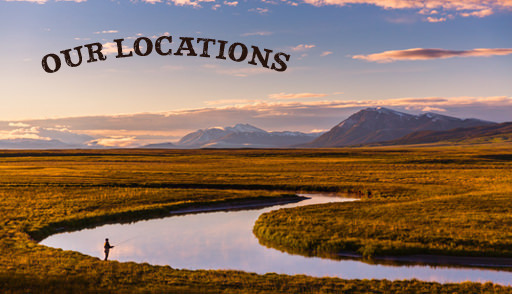 If you cannot travel with your own equipment, there are rental outfitters located in Dillon, Ennis, and other nearby towns that we are happy to direct you to. Can the J Bar L book guided tours or activities for me? While we are more than happy to provide you with booking recommendations, we are not a guest ranch and do not schedule activities for our guests staying at our vacation rental homes and cabins. What is there to do during shoulder season or the off season? Our Centennial Valley vacation rentals are available May-October. While many folks think of Montana as the perfect backcountry summer escape, there is much to do in the area during the spring, fall, and winter. Watch for the spring migration of the trumpeter swans or visit us in the fall to see the aspens light up electric yellow as the season begins to turn. From our Twin Bridges Fishing Cabin, available year-round, ski, snowshoe, and snowboard to your heart’s content. Always wanted to bag that big buck? The Fishing Cabin is a great place to stay during the hunting season. Or book a fly fishing weekend to catch the first hatch of early spring dry flies. Plan on touring Montana’s natural wonders? Visit either of our locations during the shoulder season and avoid long lines and crowded parks. We promise, Montana is breathtaking year-round! Do I need a license to fish or hunt in Montana? Yes! You can purchase a license here or through your guide, if you book with one of the region’s excellent outfitters. How should I prepare for interacting with wildlife? The J Bar L’s Centennial Valley vacation rentals are nestled in the midst of critical wildlife migration path. You are sure to witness some of the numerous wildlife that call this valley home. We recommend you bring your camera (we provide binoculars to share) along with your common sense. We have never had an incident or bad wildlife encounter at our vacation rentals, but please respect the wildlife and keep to yourself––remember these are wild animals, not pets. If you ever find yourself closer than you’d like to an animal, remain calm. Usually wildlife are not too keen on encountering humans and will avoid you if they see or hear you coming. Also be sure to not leave your food and drinks outside, since it can attract hungry critters. It is unlikely you will see any wolves or grizzlies (unless you go looking for them) while you are visiting the Centennial Valley, but you may spot a black bear or a moose, and you will certainly see antelope, deer, and some of the hundreds of bird species that flock in the valley. If you plan on exploring in the nearby mountain ranges, we recommend taking every precaution to ensure a safe and pleasureable experience. This includes carrying bear spray, which is available through our guest manager, and making some noise to ensure nearby wildlife know you’re on your way. For more great tips and suggestions for how to act around wildlife, please see this handy guide on the Montana Fish, Wildlife, and Parks website. Can I participate in ranch activities? The J Bar L no longer offers guests working ranch experiences, as it once did. You are more than welcome to tour the ranch, however we do not allow guests to participate in ranch labor. We do have a hiking guide on staff that would love to show you around the ranch and the Valley. If you are interested in horseback riding while in the Centennial, we encourage you to book a guided trip with Centennial Outfitters. How close is the J Bar L to Yellowstone National Park? The J Bar L Ranch’s Centennial Valley location is approximately 2 hours west of Yellowstone National Park. We recommend getting an early start so you can enjoy a full day at the park and take in its many sites.